Ash Mistry finds himself in deep danger when he spends a summer in India, encountering hideous demonic creatures and Lord Savage’s ultimate plan to destroy the world! Why did I read this book: I was a huge fan of Sarwat Chadda’s Billi Sangreal series and had been waiting to read this new series for a while. Ash Mistry and younger his sister Lucky are visiting their family in India during their school holidays. Ash had been excited about the trip, history geek that he is, but he is now ready to go back to London and resume his teenage life of gaming with his friends. But then his uncle is hired by Lord Savage, a rich mysterious man, to decipher ancient scrolls. These scrolls are connected to one of the most famous stories in India: the Ramayana, the epic story of the fight between the hero Rama against the rakshasha (demon-like being) Ravana and Savage hopes to find Ravana’s resting place for nefarious purposes. Not that Ash believes in any of that of course- to him, they are merely stories of his ancestors. Until the supernatural knocks on his door and he realises that these rakshashas are totally real – and out to get him and his family. When tragedy strikes and his relatives are murdered, Ash finds himself alone with his sister and he will do anything to protect her against their enemies. Unfortunately for Ash, the stakes are much higher than that and the fate of the entire world might be on the hands of this 13 year old boy. I love nothing more than to write reviews of books I loved and Ash Mistry and the Savage Fortress is SUCH a badass book in many ways, I don’t even know where to start. I’ve loved Sarwat Chadda’s Billi Sangreal books (and I think they were criminally underrepresented online) and was quite excited about his first foray into MG writing. It was so much more than I was expecting and so much fun too. First of all: this is a story set in India, immersed on Indian mythology, with an Indian British hero and its focus never leaves its setting – so for example, you won’t find Western philosophies mingled with the Eastern stories and even though Ash’s British side is very much a huge aspect of his character, he sees himself as Indian. As such, there are traditional elements of Indian culture that are an intrinsic part of his life. I also loved his relationship with his family especially his relationship with his sister – he is very protective of her because that’s how he feels families must be like, their relationship mirroring that of his own father and his brother. Another aspect worthy of mention is how the story takes the Ramayana as point of departure and expands on it. Hindu Gods and Goddesses are an effective part of daily life and Ravana now has a half-human daughter, who is an awesome female character named Pavarti and who becomes Ash’s ally. I also loved how the concepts of heroism, Karma and reincarnation are a huge side of this story and how these ideas are incorporated into the plot. This is actually kind of cool and it opens up the possibility of discussion on these topics. For instance: is Ash a hero because he MUST be a hero or is he a hero because it is his choice? Could it be a mixture of both? I hope that this is further explored in future instalments. My one nitpick comes here: Ash is a reluctant hero and there is a bit of repetitiveness in his internal monologue emphasising this reluctance. This is also quite the dark story, quite bloody and inclement: Sarwart Chadda never shies away from killing people, even major characters and that’s awesome because when we are talking conflict in such a huge scale (the fate of the world is at stake, after all), the sense of danger needs to be real to make the story believable. There is real loss and real grief here. And with all that, the book also manages to be simply fun and cool. From Ash learning how to fight, to the action sequences that are bloody awesome; from his realisation that he has a powerful ally on Pavarti to a cameo by the Goddess Kali, it’s all good stuff. And this is only the beginning of a series that has SO MUCH potential for growth it’s not even funny. 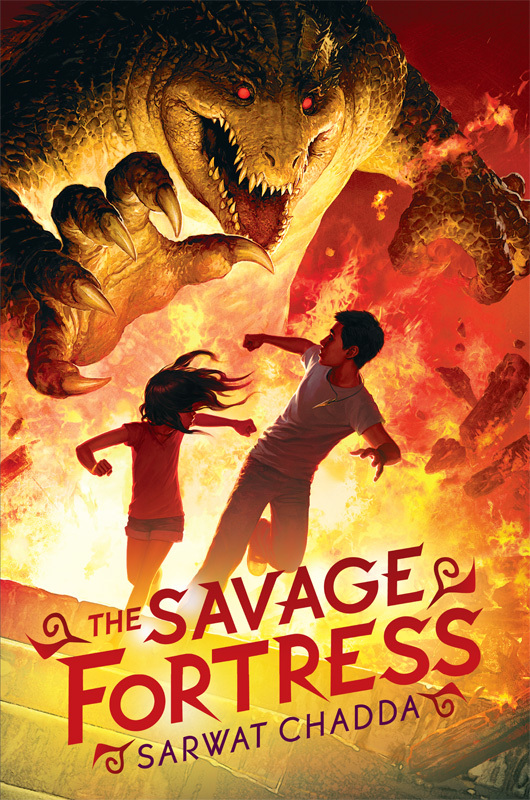 Ash Mistry and the Savage Fortress is definitely a great book for kids but it also has good crossover potential for adults. Brilliantly done and definitely a highlight of my reading year so far. Age: Four and a half thousand years, give or take. Appearance: Can vary from serpent-like with fangs to almost normal 15 year old girl with fangs. And green eyes with narrow vertical irises. Basically if you’re close enough to see my eyes, you’re probably about to die. Quite horribly. A Bit About Myself: I really don’t see why I have to engage in this infantile exercise but Ash says he needs it for his summer project. So, my father was Ravana, the greatest demon king of all time. My mother was a human princess. Theirs was not a happy marriage. I’ve been around for a long, long time, constantly reincarnated and I’ve killed so many men that I’m classified as a ‘near-extinction event’. My Favourite Things (and not so much): Weapons, I have a large collect of swords and knives and suchlike. 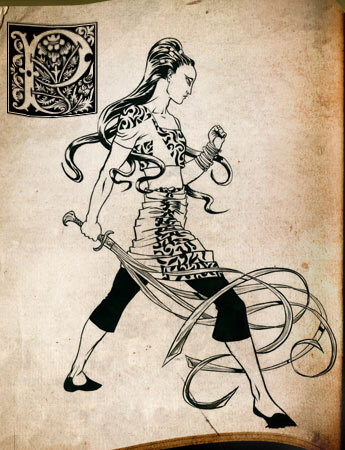 My favourite is the urumi, the serpent sword. Four strips of razor sharp steel about 2m in length. I can sever all four limbs off a man with a single flick. You’ve never met any quite like me. If you had, you’d be dead. My favourite day was when I wiped out the 300 Spartans at Thermopylae. The historians say it took the entire Persian army of a million men to do it but that’s because they’re embarrassed to admit the toughest warriors in the world were slaughtered by a fifteen-year old girl. On the downside I didn’t really enjoy the middle of the nineteenth century. Hmmmm, interesting review. I think I like the version of the cover on the right, though. The one on the left reminds me of Star Trek! I am so excited about this. SO EXCITED. If Parvati speaks like that in the book itself, this sounds totally awesome indeed. But maybe I’ll start my experience of Sarwat Chadda with a female heroine, since you recommend the Billi Sangreal books, too. i did not finsh the book. In the Review part, in the begining. It is not put correctly, it says – Ash Mistry and younger his sister Lucky – Should it not say, Ash Mistry and his younger sister Lucky. Yeah, was just wondering.